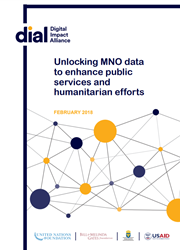 Today, the Digital Impact Alliance (DIAL) released Unlocking MNO Data to Enhance Public Services and Humanitarian Efforts, which provides insights to governments, humanitarian organizations and mobile network operators (MNOs) on the shared value proposition of using MNO data for development (D4D). View the full report, Unlocking MNO Data to Enhance Public Services and Humanitarian Efforts, here. The Digital Impact Alliance (DIAL) aims to realize a more inclusive digital society in emerging markets, in which all women, men and children benefit from life-enhancing, mobile-based digital services. A partnership among USAID, the Bill & Melinda Gates Foundation, the Swedish Government and the United Nations Foundation, DIAL’s efforts help accelerate the collective efforts of government, industry and development organizations to realize this vision. http://www.digitalimpactalliance.org. Delta Partners is a leading advisory and investment integrated platform globally. We are a unique hub for people, capital and knowledge to address challenges and opportunities in a transforming TMD industry. With offices across the world, in the United States of America, Colombia, the United Arab Emirates, South Africa, Spain and Singapore, we serve our clients around the globe. Our unique business model enables us to serve our TMD clients through our four business lines, Management Consulting, Corporate Finance, Fund management and Ventures. http://www.deltapartnersgroup.com.